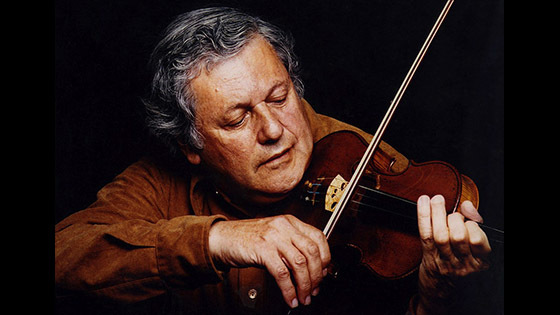 January 3, 2018, 6:52 PM · Violinist Robert Mann, founding first violinist of the Juilliard String Quartet, died in Manhattan on New Year's Day, at the age of 97. Mann was first violinist of the Juilliard String Quartet from its founding in 1946, until 1997. He taught at both the Juilliard School and the Manhattan School of Music and was a longtime president of the Naumberg Foundation. Robert Mann. Image from the documentary, Speak the Music. "Through his passionate artistry and teaching, he inspired generations and touched us all," stated the Juilliard String Quartet on its website this week. The quartet currently includes Joseph Lin, Ronald Copes, Roger Tapping and Astrid Schween. "It is hard to find the words to do justice to the life of Mr. Mann. We in the quartet will always remember him." Born July 19, 1920 in Portland, Oregon, Mann began playing the violin at age nine, and at age 13 started studying with Edouard Hurlimann, concertmaster of the Portland Symphony. At age 18, he moved to New York City to attend the Juilliard School, where he studied violin with Edouard Dethier, composition with Bernard Wagenaar and Stefan Wolpe, and conducting with Edgar Schenkman. Mann won the Naumburg Competition in 1941 and made his New York debut two days after the attack on Pearl Harbor, according to Wikipedia. He was drafted into the U.S. Army shortly after his graduation from Juilliard. "I knew... that I was never going to be a great solo violinist. But it seemed to me that, since I could read all of this music... I could be a chamber musician," Mann said in a 2014 documentary, Speak the Music: Robert Mann and the Mysteries of Chamber Music, by Oscar-winning director Allan Miller. "I played only about 6,000 concerts with the quartet...and you learn, not from the people's praise, but from the critics and the people in the audiences' criticism. You learn over the years, what works and what doesn't work." Mann said that critics didn't always understand the quartet's approach, particularly to Beethoven. "We felt that Beethoven really was this absolutely dramatic, aggressive person who wasn't compromising his expression," Mann said in the documentary. "And so we played in a way that almost all the great quartets besides us didn't play." During Mann's 50 years with the quartet, every other member was replaced, some more than once. As a teacher and mentor, he worked with the Alexander, American, Concord, Emerson, New World, Mendelssohn, Tokyo, Brentano, Lark and St. Lawrence strings quartets. Having won the Naumberg Competition as a young man, Mann later served as president of the Naumburg Foundation, from 1971 to 2015. His son Nicholas currently serves as the foundation’s co-president. "Robert Mann was a devoted instrumentalist, serving a remarkable 51 years as the founding first violinist of the Juilliard String Quartet," said Neil Portnow, President and CEO of the Recording Academy, in a statement Wednesday. "As a member of the internationally renowned ensemble, Robert received 16 Grammy nominations and collected four Grammy Awards between 1960 and 1994. Robert was known for his unparalleled technique, passionate approach to classic and contemporary music, and as the driving force behind the long-running success of the quartet. He will be remembered always for his artistry and unwavering dedication to chamber music." January 4, 2018 at 02:30 AM · R. I. P My deepest deepest condolence to Juilliard Quartet. January 4, 2018 at 03:15 PM · Laurie, Thanks for a wonderful tribute! If I'm doing the math correctly, Mann played in the Juilliard Quartet until he was 77 years old. If that's not an inspiration, I don't know what is! I look forward to watching the complete documentary.